I've been campaigning hard in South Carolina and I have definitely enjoyed the challenge of campaigning to African-Americans for the first time in my career. The number of black Republicans is small, but substantial and I've relied on everything that I learned from Michael Steele to reach out to them with an urban suburban vibe and good conservative values yo digity. I had gotten some flack in New Hampshire, when a microphone I thought was off recorded me saying I would have no black people in my administration. Unfortunately, some of my opponents tried to use my statement out of context. I believe everybody who knew me understood that I meant people with black souls and what I said meant nothing about skin color. 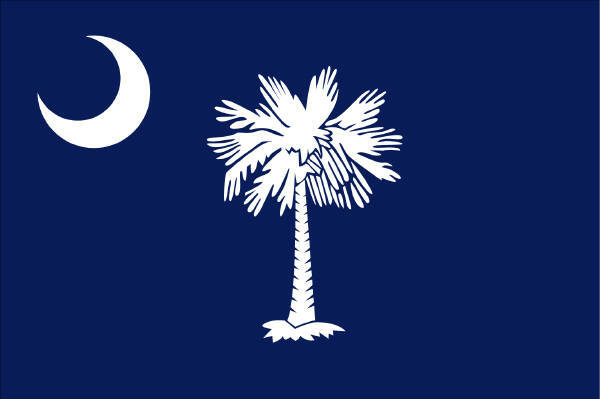 On my first night campaigning, I became aware of what I believe is the first signs of a possibly sinister Muslim caliphate in South Carolina. I saw suspicious people putting these blue flags with a crescent moon and palm tree by the microphone I would be using to address a crowd in Myrtle Beach. I had my security chase them off and called in a bomb sweep that turned in nothing. Later, I cornered one of the people I saw with the flags and he tried to tell me they were state flags, but I know the South Carolina state flag and I'm pretty sure it is a variation on the old confederate stars and bars. I have since seen these blue crescent flags all around the state and they are extremely unsettling as are the reactions of the people here who walk past the flags as if nothing is out of order. If the Caliphate has infiltrated a conservative NASCAR loving state like South Carolina, we are in more trouble than I ever thought. yep, just noticed it on the cover of the sunday New York Times paper..in the voting area..and they are just slighty higher than the red white and blue flags..technically not a US flag but...not supposed to be anything higher than a US flag..